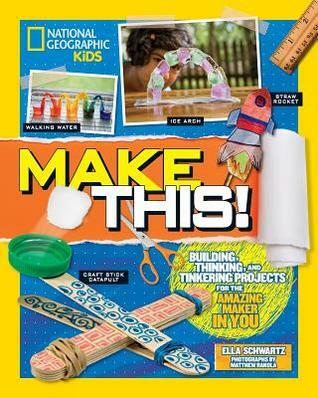 Create your maker space with this fun and instructive book, chock-full of hands-on activities and cool experiments to get kids thinking and tinkering. This book is designed to inspire the next generation of engineers and supports all kinds of kid creators: those who prefer guided instruction, those who prefer to dream up and design objects on their own, and everyone in between. With thoughtful text and bright illustrations, kids get the tools and the know-how to tackle all kinds of exciting projects: building a kaleidoscope, designing a fidget spinner, planting a rain forest, creating a musical instrument, and more. Unconventional scenarios inspired by real National Geographic explorers give kids a chance to think outside the box and apply their maker skills to real life. Chapters are divided up by scientific principle, such as simple machines, energy, and forces. In each chapter, kids can start by following step-by-step activities, or get creative by tackling an open-ended challenge. Helpful sidebars explain the science behind what's happening every step of the way. Make This! is perfect for curious and STEM-loving kids, families looking for a fun way to play together, and anyone else who's ready to get creative and start tinkering! Your Kidliterati friends are so happy for you, Ella.